PLEASE NOTE: To view pedigrees for The Boys, see under heading PEDIGREES. Major win at Balston Spa circuit under Marion Lyons and also Diane Pilbin the next day. SHOW WINS: Caper receieved his first two points under judge Charlotte McGowan at 18 mos of age at Greater Lowell K. C. show Jan 2010. In May 2010, Caper was awarded Winners Dog, & Best of Breed under judge, Joe Tacker at the So. County K. C. show. Caper's first major win out of the Am Bred Class was under Bob Ennis at the Springfield K.C. show Nov 28th, 2010 (3Pts). Best of Breed under Judge, Linda Moore July 1st, 2010, Caper was up to 8 points with 3 BOB wins. Best of Breed at Greenwich Kennel Club show, Jun 9, 2012 under Judge: Mrs. Mareth K. Kipp. Caper was also awarded Winners Dog under judges Marion Lyons and Diane Piblin at the Balston Spa circut of shows, Aug 10th and 12th, 2011 for two majors. Caper finished his championship under judge, Kurt Anderson, Aug 27th 2011 at the Newton K.C. show. Caper was awarded Select Dog under Judge David Hopkinson (Rocheby) Thursday, Sept 22, 2011 at the PRLRC specialty, Judge, Pierry McLean (Castlegar) awarded Caper Select Dog at Skylands LRC Sept 2011. Judge, Kurt Anderson awarded Caper Select Dog at the Gov. Foot Guard Feb 2012. Caper finishes his Grand Champion title going Select Dog under Desmond Murphy on the Wine Country Circuit, Sept. 26th 2013 Caper's was also Select Dog under judge, Brian Parrott, PRLRC Specialty Sept. 18, 2014. In photo- judge Desmond Murphy awarding grand championship points. OFA prelims excellent, OFA Excellent and elbows clear, Chocolate, pure for chocolate, no yellow. Eyes-Clear, PRC Carrier, EIC Normal Clear, Hereditary Nasal Parakeratosis Normal Clear, Non-dilute. Heart clear/ 8/17, Eyes cleared yearly. Thank you, Kristina Rock for taking such wonderful care of Buckley during his stay with you and of coarse for showing him to his championship! Buckley, just a few days shy of his 2nd birthday. Photo by Tina Donahue - assisted by Kristina Rock. Thank you both! Stonecrest's American Tourister Ben Travlin "Ben"
Sire: Can. Ch. Epoch's Louis Vuittton at Castlegar Dam: Stonecrest's Helen Girlie Brown DOB: Nov 30, 2011 Eyes cleared at 8 weeks of age & at 14 months, OFA Good, OFA Elbows Clear, EIC Normal-Clear, PRA Carrier, CERF, Pure Chocolate, Non-dilute. Benny is living with our niece, Sarah White Juriansz and her family. In memory of my BFF, Davy. OFA Good, PennHIP 85% breed profile, PRA and EIC carrier, Heart cleared at 9 years of age. 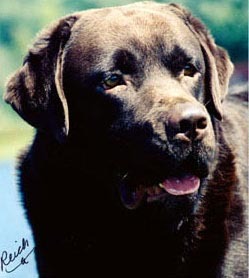 Lucky was owned and Loved by Louise and George White. Lucky's DOB: March 2, 1999, Black carrying chocolate. Passed Spring, 2012. OFA Hips Good, Elbows Clear, PRA Carrier- Pattern B, CERF.